SAP Business one is an ERP software tool which is designed for small and medium organizations. 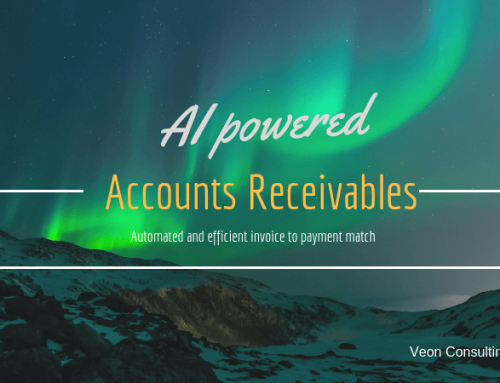 It automates all business processes. It is available on-premises and cloud versions. 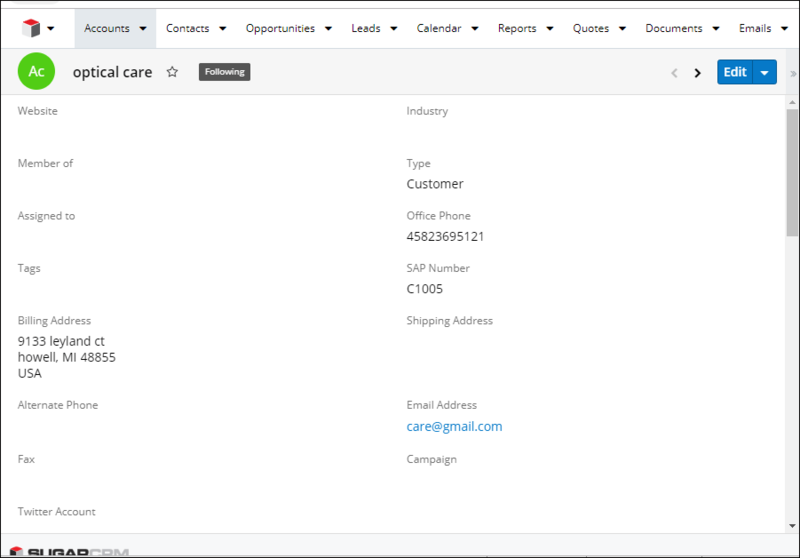 Get to know the full feature list of our SAP SugarCRM connector solution here. 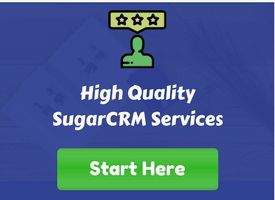 SugarCRM is a popular CRM solution for companies across sizes and industry types. 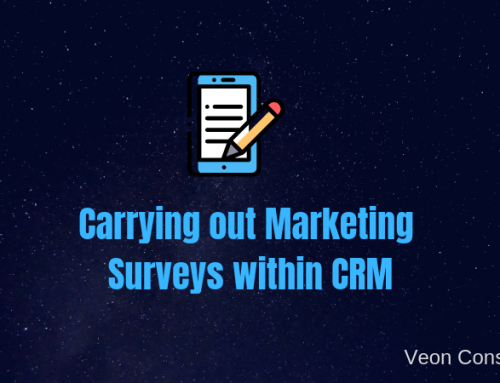 It takes care of marketing, sales and customer support for improved customer engagement and support. SugarCRM is highly flexible and can be customized according to the business requirement of the organization. Following are some of the reasons why this integration is needed. Due to SAP architecture as well as cost reasons, not all the salesperson have access to SAP systems. Usually the access of SAP is confined to the workforce within the headquarters. Usually the people accessing SAP are finance, warehouse and sales coordinator along with senior management. 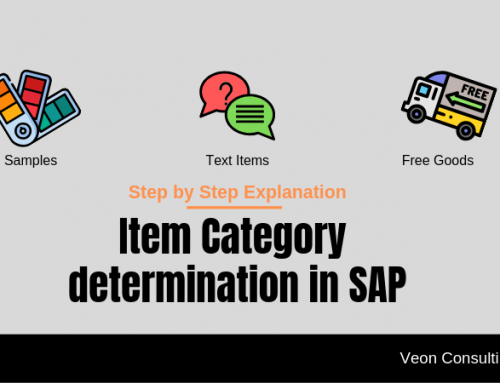 The information within SAP is crucial for sales people to have list of accounts, know pricing and be able punch in orders or get the quotation. 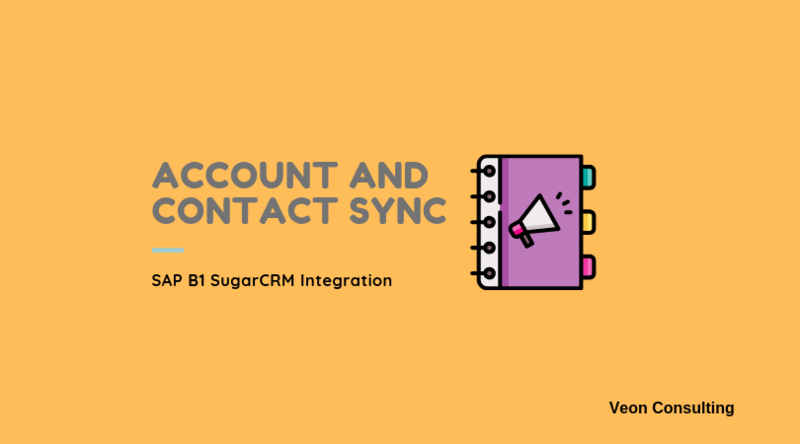 In this article, we will look at how they can create Accounts within SugarCRM and sync it with SAP Business One and vice versa. 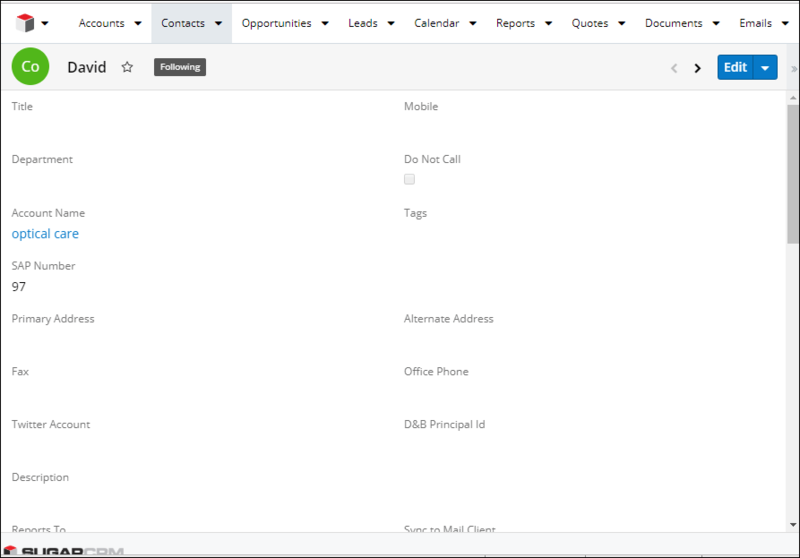 This forms the base of all the activities within SugarCRM. For syncing the accounts and contacts, and syncing them we need to follow certain steps. These are shown in this section. 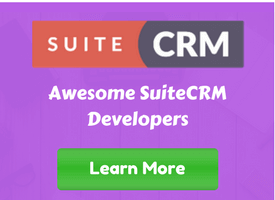 We use APPSeCONNECT, a .NET connector which can translate SAP information into SugarCRM understandable REST protocol. Following points will be discussed in this article. Demonstration video – In this demonstration video the sync process has been shown in details. The process can be set up in automatic mode at the desire frequency. Login to the SugarCRM. This will open the Dashboard (which is shown in below screenshot). Now Click On Accounts module and click on Create button (Which is shown in below screenshot). Enter the Account related information like name, Industry, billing and shipping addresses. Click on save button (which is shown in below screenshot). 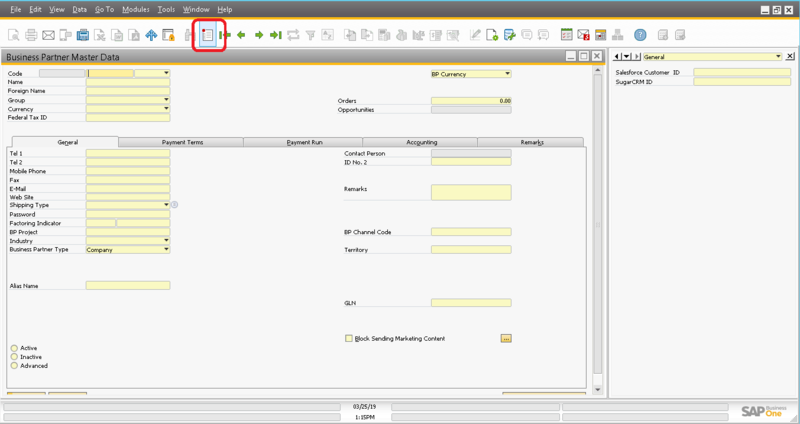 Once the account is created, SAP Number is updated after syncing to SAP B1. 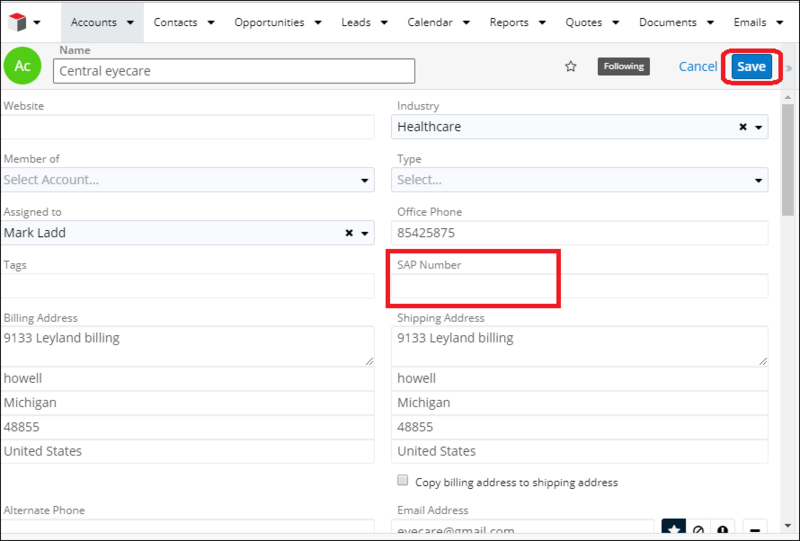 Now Click On Contacts module and click on Create button (Which is shown in below screenshot). Enter the Contact information like name, Account, and Mobile. Click on save button (which is shown in below screenshot). 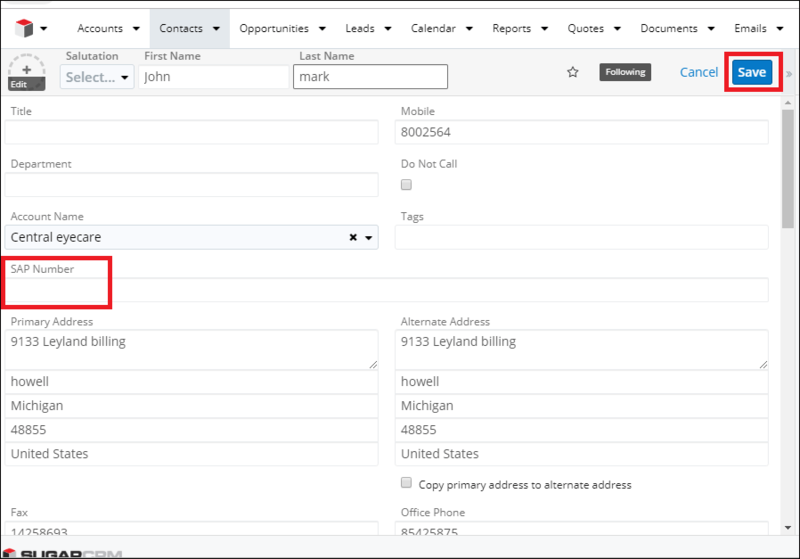 Once the Contact is created, SAP Number is updated after syncing to SAP B1. This application Acts as Bridge between these two applications. We need to configure the credentials in the .Net application. 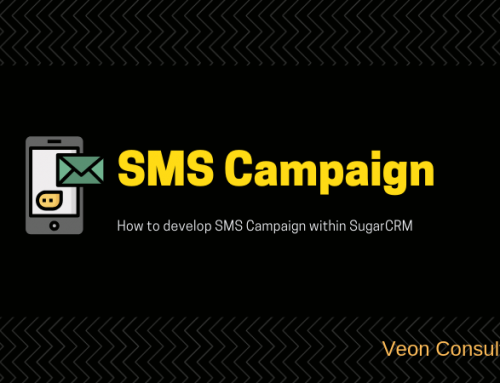 By using the web service (REST) it communicates with the SugarCRM. 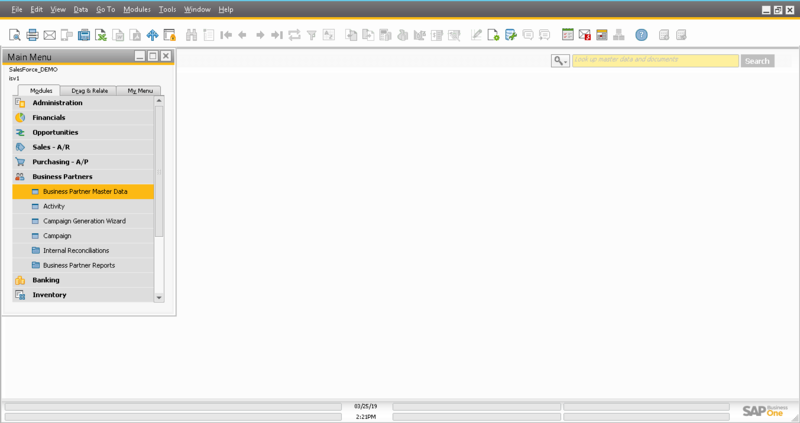 With the help of DI API(DI server),It communicates with the SAP B1. Data integration is bidirectional. We need to map which fields need to synchronize between these two applications. For Account, Name, Email, Telephone, Billing, and Shipping addresses needs to sync. 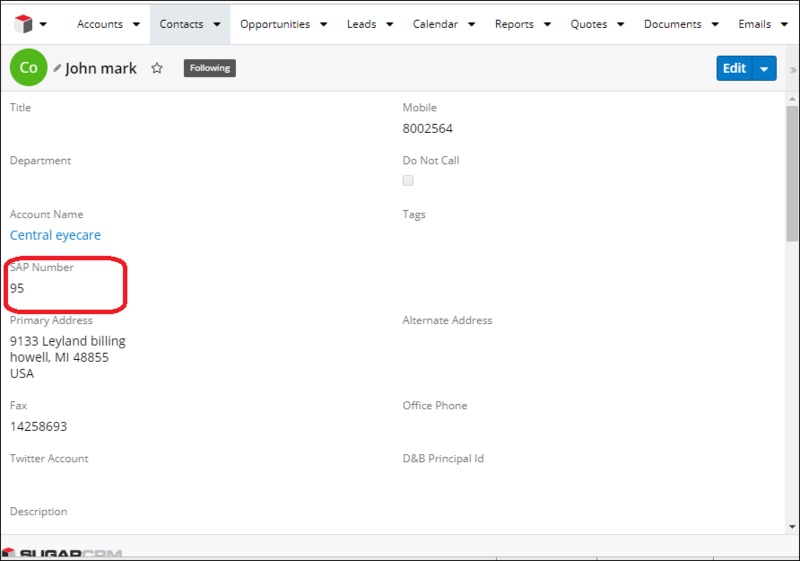 After successful sync, SAP numbers are updated in SugarCRM (which is shown in below screenshots). 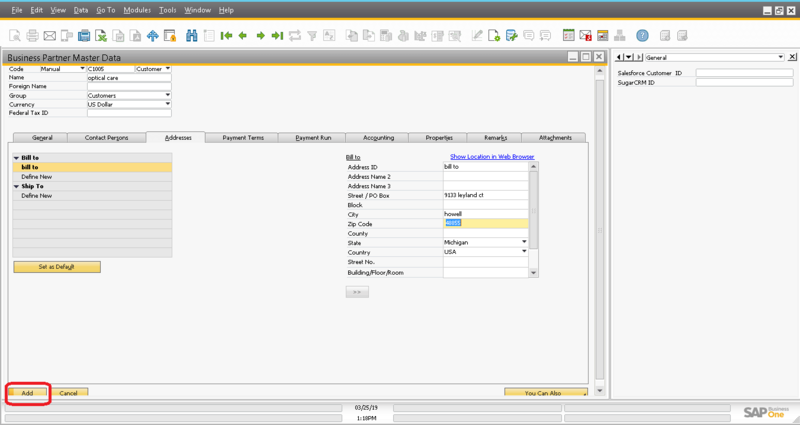 Account and Contact are created in SAP B1(which is shown in below screenshot). NOTE: The synchronization process in the above-mentioned scenario requires a dependency which is that customers need to be synced before their contacts can be synchronized. 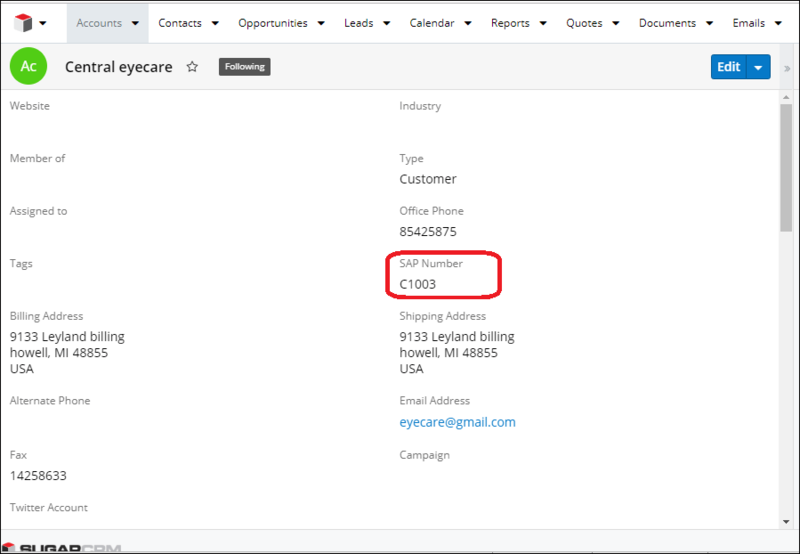 Having seen the Account sync from SugarCRM to SAP Business One, lets look at how the data syncs from SAP Business One to SugarCRM. 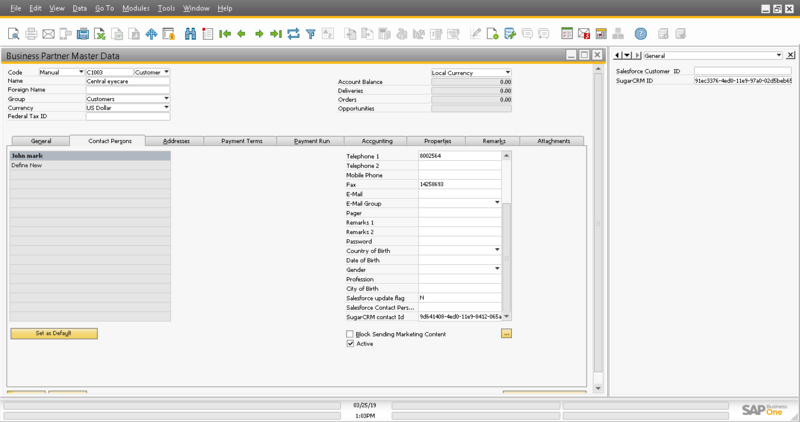 After login to Business One GUI Navigate to Business partners and Click on Business partner Master Data (which is shown in below screenshot). Enter the Account and Contact person details and Click on Add. 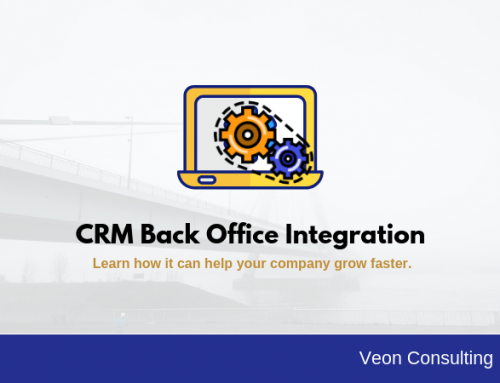 By using .Net application, you can Integrate SAP Business One with SugarCRM. 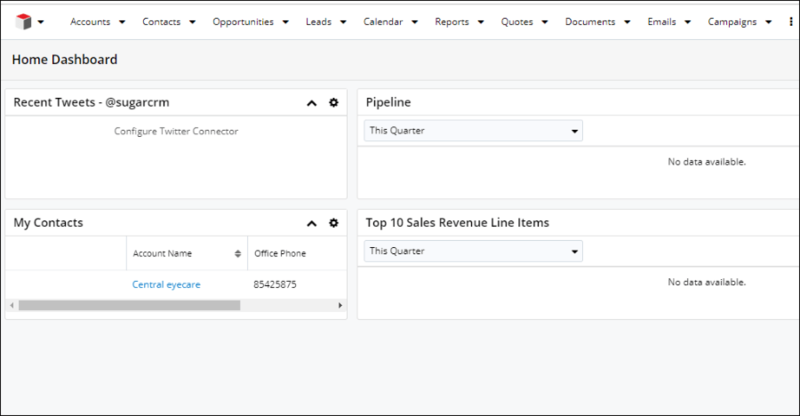 In this way, we can also integrate Product, Opportunity, Quote, Order and Invoice. We sincerely hope that this was useful and any comment of feedback will be very helpful. Reach out to us so that we can demonstrate our solution and assess your SAP Business One SugarCRM integration need. Let’s build an efficient system, which you will use for years to come.